As I hiked across the Harvard Bridge from Cambridge to Boston at 7:20 this morning, this crew team rocketed past me under the span. Although the air temperature was 38 degrees, my workout was generating enough heat to make me toasty in a short-sleeve shirt. (I walk at nearly four miles per hour.) 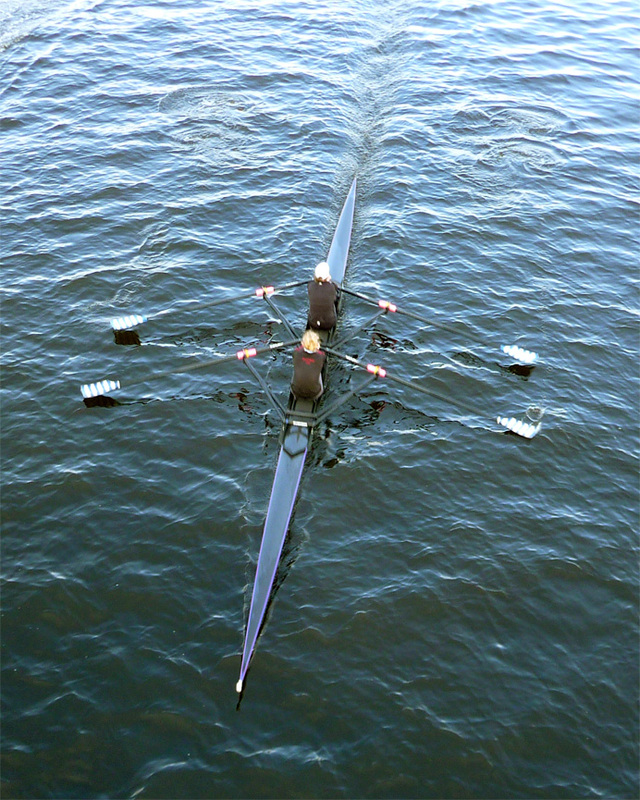 Why, then, were these rowers wearing sweaters? After all, they were working a lot harder than I. To answer that question, when I got back to my hotel I did some calculations based on things Mr. Allen taught me in high-school physics. I have to stop here and say a word about Mr. Allen. Lucky for me (and thousands of others), Jim Allen was the kind of teacher who could make you remember something for 40 years. Second, Mr. Allen insisted on everyone's rapt attention. He had remarkably keen hearing. Once, when two students began whispering while he was writing an equation on the board, he paused with the chalk still resting on the slate and, without turning, shouted into the board, "DAVID AND LINDA! IS THIS SOMETHING YOU'D LIKE TO SHARE WITH THE REST OF US?" Finally, Mr. Allen loved his subject and wanted everyone to know its wonders. It was Mr. Allen who, in an age when TV was never used in classrooms (I went to school during the film-strip era), hooked up a black-and-white set in the hallway so everyone could watch the Ranger spacecraft transmit live images as it crashed into the moon. I wouldn't trade that moment for anything (except the time in grade school when Martha Green kissed me in the coal shed). So, back in my hotel room, I put some of Mr. Allen's principles to work. According to DietPower's exercise log, my four-mile-per-hour walk burns about five calories per minute. Had I been rowing with these two, however, I would have expended a whopping four times as much energy. This would argue that the crew team didn't need shirts at all; they could probably have rowed naked. But, as Mr. Allen would say, "There's more to it than that." In any kind of locomotive exertion (running, walking, rowing), two factors come into play. While our muscles are generating heat, the air we are rushing through is stripping us of heat. So I calculated some more, and grew even more puzzled. As NCAA level athletes, this pair would have been racing at about 12 miles per hour—three times faster than I walk. Since they were generating four times my heat but moving only three times my speed, I figured the wind should be robbing them of only three-quarters of their heat advantage over me. Hence, they still ought to feel warmer than I, not colder. So again, why the sweaters? Then I remembered something else Mr. Allen told us. A wind's force rises not with its velocity but with the cube of its velocity. This means that although they were moving only three times faster than I, the wind was ripping heat from their bodies 3 x 3 x 3 = 27 times faster. I'm surprised they weren't wearing parkas. About this page: Precisely at noon each day, I step out of my office for a 3.5-mile walk around my Connecticut neighborhood. (Today I was in Massachusetts, so I took my walk there.) I carry a Panasonic Lumix DMC-TX5 pocket camera with a Leica 10x optical zoom lens. My object is to make an interesting photograph of at least one thing that is different that day. I post the results here, hoping they will inspire you and your friends to walk, too. —Terry Dunkle, DietPower founder and CEO.